Timekeeping and travel go hand in hand – not only are you crossing multiple timezones on your journey across the world – you also need to make sure you're arriving for flights, trains, or busses on time. So, having a decent watch strapped to your wrist is a necessity. We think the Certina DS Action GMT Automatic, with its separate 24-hour indicator, light weight, and high durability, is the ideal companion for your travels. A GMT watch is capable of showing two timezones at once. You can use the regular set of hour, minute and second hands to tell the local time where you are, and the fourth GMT hand and 24-hour bezel to tell the time at home/origin. Of course, this feature isn't just for travel, and can also be useful if you have colleagues working in different timezones. The case of the DS Action GMT measures 43mm and is made from black PVD-coated stainless steel. It houses an automatic Powermatic 80 calibre with a long power reserve of 80 hours. The hands and indices are coated with green Super-LumiNova, and are clearly visible on the matt black dial, even in darkness. In keeping with its sporty character and robust workmanship, the watch is fitted with a khaki-green fabric strap with a pin buckle, which will see you though many flights to come. It's also waterproof to 20 bar, so will survive a dip in the sea (or hotel pool). 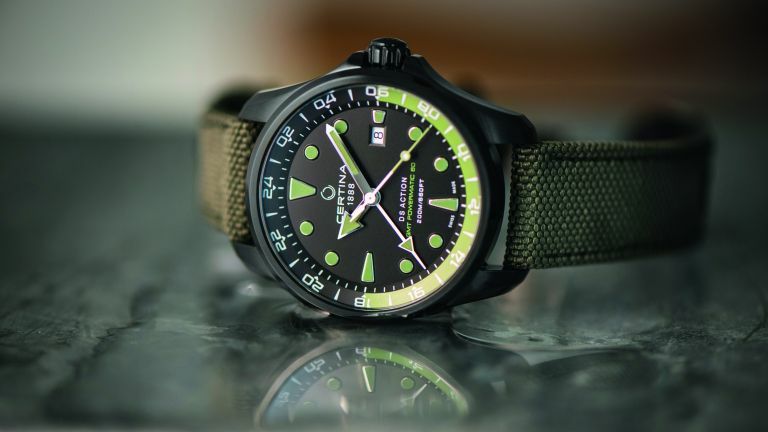 As an alternative, designs are available with a choice of black PVD case, brown accents and a NATO leather strap or a steel bracelet, black dial and green or red details.